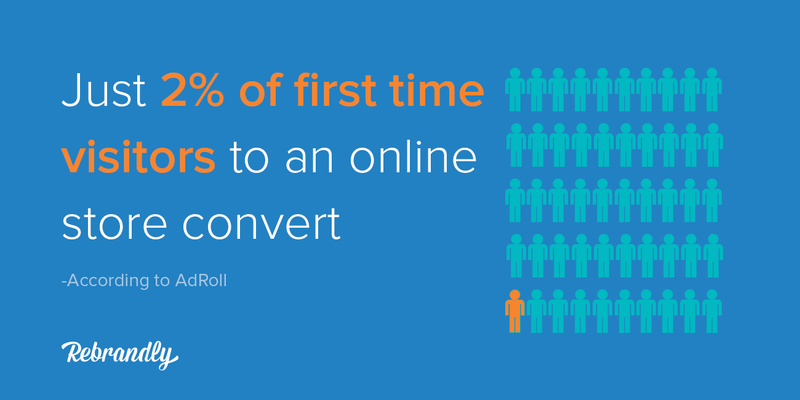 Sure, a small percentage of visitors convert, but wouldn't you love to get people back to your website again in the hope that they might convert the second time around? Grabbing customers who have left your site without signing up for a newsletter, completing a registration or making a purchase is actually quite easy. Instead of starting at square one, retargeting can be key to re-engaging with and converting customers who looked but didn’t buy the first time. Retargeting, also known as remarketing, is the digital version of grabbing someone who is about to leave your store and giving them a personalized sales pitch. There's a reason that sales associates trip over themselves in mattress stores to catch you before you leave. These salespeople know that if they can engage you in conversation and learn more about your needs, you're much more likely to find what you're looking for and get you to make a purchase. 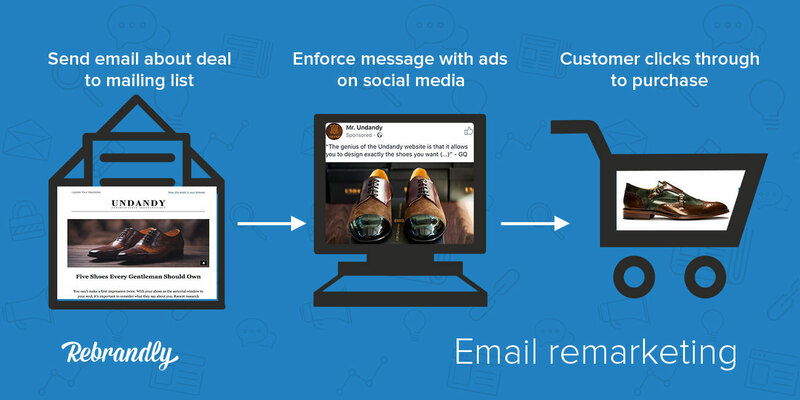 Retargeting allows online merchants to take a similar approach. You can engage with consumers, even after they've left your website, and make additional attempts to convert them as they travel throughout the web. With three in four consumers noticing retargeting ads and 63% of marketers dedicating a portion of their budget to it, retargeting is a hot topic in marketing at the moment. It's also one of the most successful tactics, with website visitors who subsequently see retargeted display ads being 70% more likely to convert. Retargeting is a cookie-driven technology that allows you to track visitors who have left your website without purchasing and then target them with display ads on various platforms. It is an ideal remedy to shopping cart abandonment and it will significantly boost brand awareness too. The platforms you retarget people on can include email, Google display ads, Facebook and Twitter ads. These ads can be highly targeted for viewers. That’s why they prove to be so eye-catching and engaging, because visitors that are presented with them have already shown an interest in your company or products. While a couple of consumers might find this a tad intense, it’s not an issue for most. Some people will be unaware or unconcerned by your retargeting attempts. But others will actually be pleased to be reminded of something they may have forgotten about and to be targeted with ads that are relevant to them. Retargeting also allows you to provide specific offers, such as a pricing discount, free shipping or related products, that entice users back to your site to complete their purchase. Who wouldn’t be happy with that? Retargeting is possible on social sites like Facebook, Instagram, Twitter, and LinkedIn. Social media is a great place for retargeting ads, because followers and friends can help drive engagement with brands. How does this work? 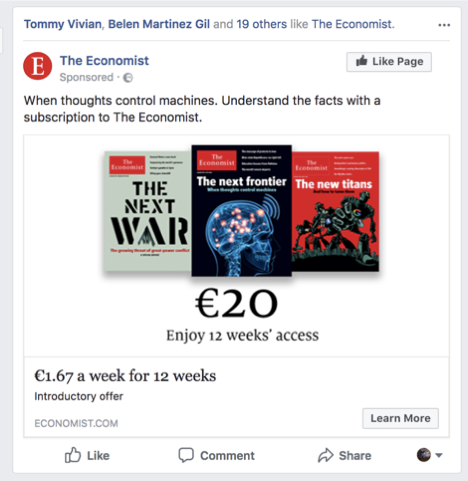 When you see retargeting ads on Facebook, such as the one below, you're not only seeing that you're getting a special offer with a clear call-to-action, but you also notice that several of your friends "like" the brand. Often the ad itself has been liked too and if it’s an event you’ll see which of your friends are attending. This adds legitimacy to your brand and the message you’re sharing. This can be incredibly powerful, especially when shown next to a discount message. If a visitor had any doubts about your business’ credibility or were unsure about purchasing from a site they had never been to before, this should help alleviate their concerns and encourage them to convert. Because of its advanced targeting tools and ad products, for promotions on social media, Facebook tends to offer advertisers the best ROI. For your retargeting strategy, you can create custom audiences for your ads based on visitors to your website at large, or to visitors of specific pages. This is a great way to retarget high-potential individuals. If you add Facebook pixels to your product pages, sale confirmation pages, and shopping cart buttons, you’ll be able to send specific ads in the direction of people who looked at or bought your products. For those who added an item to their cart, but never checked out, they can be reminded of their abandoned shopping cart. Or, more simply, ads can feature a product that visitors showed an interest in. You can also segment your audiences by criteria like the value of their shopping cart and whether they are repeat customers, so you can present them with ads specifically suited to them. Additionally, if you wanted to kick it up a level, with Facebook you can also use sequential retargeting. This means visitors would see a different ad about your brand over a few days. You might feature an ad about an award your company won, a great blog post or a video about your business to begin building recognition. Once you’ve built up some trust and brand awareness, you might then show ads about your products. Twitter and Facebook both have guides on how to use retargeting on their sites, which you can find out here and here respectively. Google's Ad Network is a thing of beauty, as it encompasses some of the most high traffic websites on the planet - all of which are now available to you for your remarketing ads. 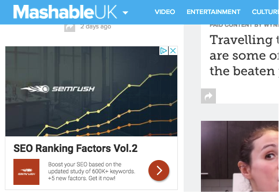 The great part about this is that most brands couldn't afford to place a 250x250 ad on Mashable or MSN, for instance. But retargeting ads on this prime real estate are much more affordable. Similar to Facebook, with Google Adwords you can do some basic remarketing, or you can retarget visitors with ads that feature the products they viewed on your website. In addition, you can use something Google calls for remarketing lists for search ads or RLSA as the pros in the industry tend to call it. With RLSA you can utilize the remarketing lists you have in Google AdWords to adjust the bids of your keywords. So, for example, if a user has previously visited your website you can increase your bids for this audience with X% because they are more likely to convert than users visiting your site for the first time. This is an effective way to increase the probability of showing ads in the top positions in Google search results page when your most valuable audience is conducting searches related to your business. Email retargeting is a simple way to maximize the impact of email marketing campaigns. To do this, you can upload your mailing lists to Google Adwords, Facebook or whatever platform you are using. With AdWords, Gmail users can be targeted with ads across Google products and the display network whenever they are signed into Google. Alternatively, you can use a tool like Perfect Audience or Retargeter to generate a line of code to place in the HTML of your email. This is similar to the process of placing retargeting code onto your website. Then anyone who opens your email can be served with advertising related to your email message. Lots of marketers use a combination of both email and retargeting to entice visitors to convert. 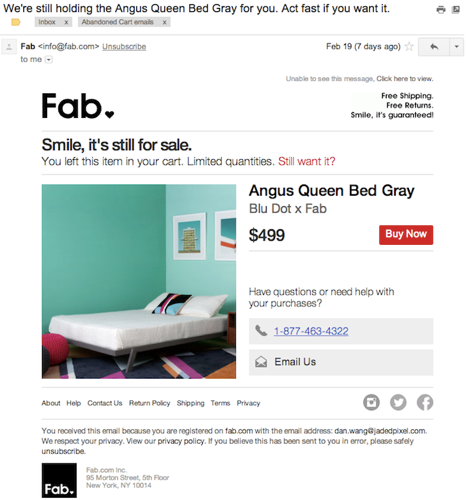 MailChimp notes that you can sell up to 50% more "stuff" by combining retargeting with other channels, like email. That’s a pretty compelling number and, if you happen to be using MailChimp, you can set up an integrated campaign and create Facebook, Instagram or Google ads to accompany your emails. You can also use the platform to send product retargeting emails that include information about the last product they viewed on your site or to remind them about an abandoned cart. It’s also worth noting that you can use CRM platforms, such as InfusionSoft, alongside your retargeting tools too. Looking toward consumers who’ve taken the time to watch one of your videos is a relatively easy way to find engaged customers. If people are willing to give up a minute or more of their life to listen to your message, the chances are they’re interested in what you have to offer. On Facebook and Instagram,you can serve ads to people who have watched all of your video - or even just half of it. If they’ve watched your video through until the end, you can follow it up with a related product ad. Or if they’ve only watched the first 30 seconds of your two minute video, you can remind them to finish watching it. 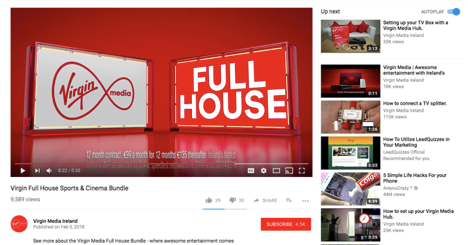 While over on YouTube, retargeting options include presenting ads to users who have commented or liked one of your videos. Alternatively, you can also target visitors to your website with video - like you would with any other advert - on platforms that support it, like Facebook and YouTube. On the Google Adwords platform, you can also target anyone who has interacted with your videos or YouTube channel with ads across YouTube, Display Network videos, websites and apps. While within YouTube, you should also make sure viewers are shown the next video in your series once they finish the previous one. Like many other marketers, you may just find that retargeting is something that works well for your business. If this is the case, it’s a wise idea to use link retargeting to add prospective customers to your retargeting funnel - even if they’ve never visited your website. With link retargeting, you can retarget ads at people who have shown an interest in your social media posts. If you share a review of one of your products or media coverage of your business from a third-party website, you can target ads at anyone who clicks on them. You can also target people who click on your curated content. For example, if your business sells environmentally friendly products and you share a newspaper article about the topic, you can retarget the people who click on that link. Because they’ve interacted with this article, it’s a good indication that they are interested in what you do, even if they haven’t visited your website. Link retargeting is easy to do. You simply add a pixel code from Facebook, Google - or whatever platform you’re using - when you shorten a link to share on social media. This is particularly helpful if a business has reached its limit for creating its own content, but still wants to increase the audience it can retarget with ads. Sure, retargeting can be time-consuming, but it will give you the best bang for your buck. It’s a strategy that pays off both in terms of long-term engagement and increased sales. Tools like ReTargeter and AdRoll can help you with the process. 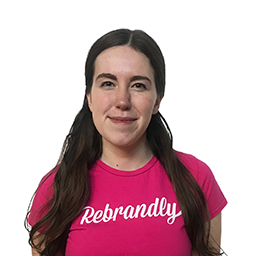 If you are interested in learning more about link retargeting and retargeting in general I recommend you to check out Rebrandly. If you’re looking to evaluate the performance of your retargeting campaign against your other marketing activities I suggest you use a marketing reporting platform like Funnel. I hope you found this article useful. If you have any comments or feedback, feel free to leave a comment.